Like with most pyramid shaped models, the shape of the model is important as it indicates that most firms start at the bottom (and is therefore, the widest part of the model) and only a small proportion of firms are at the top (where it is very narrow). Firms need to progress upwards, like climbing a mountain or a ladder. The first stage in the progression towards integrated marketing communications approach inside a company is a simple coordination across specialist areas, where they agree upon the use of a standard logo, a company slogan, corporate colors, and a general message. It is likely that various areas of marketing communication – advertising, direct marketing, sales, online and social media, and public relations – still act quite independently, yet a similar look and feel and message. Each of these functional areas would have their own goals and targets to achieve. For example, the advertising function might seek to improve brand awareness, the direct marketing area may be focused upon sales conversion rates, the public relations area might be measured upon earned media, and so on. Despite these areas using a similar approach of message and brand elements, they still generally act independently and are not strategically integrated to achieve an overall goal. 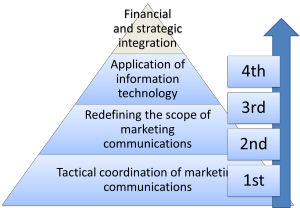 In the second stage towards integrated marketing communications, the company starts to consider a broader set of touch points than its main communication tools (several of which were mentioned above). In the first stage, the company is mainly concentrating upon the main communication tools. Second phase is when the company considers how and where a potential or current customer can become exposed or engaged with the brand. For a company to effectively understand this range of potential interactions and exposures (brand contact or brand touch points) may become a little bit more research based and consider how consumers in different target markets end up becoming customers of their brands. Therefore, the company tries to look at the brand through the eyes of a consumer. So in this stage, the company might consider email contact, interaction with staff, sponsorships, unplanned media attention, competitive comparisons, information and comparison websites, retail sales people, after sales service contacts, signage on buildings, staff uniforms, word-of-mouth, and so on -as all possibly being part of their customer’s journey towards or away from the brand. 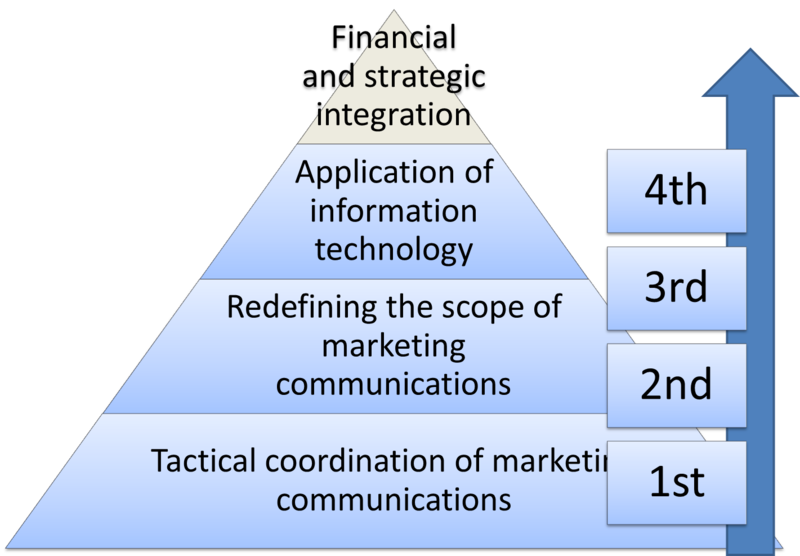 The third stage is really trying to integrate the overall communications approach, as achieved in stages one and two, across the knowledge and practices of the organization. To do this, greater use of data and information is generated and shared across their distribution channels, even extending to their retailer and supplier partners. Probably the best example of this would be in the banking sector, where the banking customer databases allow them to track each customer’s progression – either towards or away from using the company and certain products. Obviously the goal is usually to increase share of customer in this progression can be identified relatively easily with today’s technology tools in a bank. Therefore, over time, with the use of information, a bank can get very effective about understanding and even predicting the customer’s behavior when they come into contact with various marketing communications. Part of this knowledge is built through market testing and experiments, where different communication mediums and messages and combinations are tested on a small scale before being ramped up and exposed to larger numbers of customers. 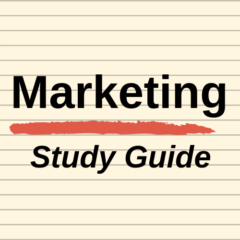 Therefore, we end up with a relatively scientific approach to marketing communications. The final stage really reflects that the overall marketing function inside a large company becomes strategically and financially integrated. The starting point for all marketing communications is essentially driven by the top-level strategic plan, which then feeds down to the marketing strategy and plan, which is then effectively executed through the marketing mix elements, including marketing communications. Contrast this to the first stage listed above, there are various marketing communication specialists act relatively independently to achieve their own targets and KPI’s. At this level of the final stage, not only are all the improvements from the previous three stages being implemented, but the organization becomes very financially and marketing metric driven in terms of its overall marketing communications. This would mean it would look at the ROI, for example, of increasing brand awareness by 5 percentage points – and work out what impact that has over time trial rates and brand loyalty and therefore bottom line impact. This becomes increasingly challenging when companies have multiple target markets to pursue the need to consider a range of strategic initiatives. As pointed out earlier in the article, only explore percentage of organizations truly operate at the fourth stage of the model.